Meditating on the lotus feet of Sri Sri Radha-Muralimanohara, placing myself at the dust of Lord Caitanya’s feet, and respectfully offering obeisances to the great devotees of the Lord, who are so many oceans of transcendental virtue, I shall now happily begin to praise the transcendental opulences of Sri Vrndavana. I am not strong enough to go to the far shore of the great nectar ocean of Vrindavan’s glories. Who can go there? However, because I love Vrindavan I will now dip into that ocean. I pray that this endeavor may become successful and bring an auspicious result. O Sri Vrndavana , please reveal in my heart Your wonderful transcendental form full of the most confidential spiritual knowledge and bliss. Embarrassed to describe the highest nectar, the Upanisads only say “not this, not this”. Where are you described? Day and night I glorify Vrndavana , which is filled with the wonder of Sri Sri Radha and Krsna’s pastimes, the wonder of the greatest sweetness, the ultimate nectar of Lord Hari, the sweetest, most beautiful auspiciousness and a flood of virtues Ananta-sesa, Siva, and a host of others cannot cross. Think of Vrndavana with love. Roll in its dust. Love it ardently. Please its moving and non moving residents. Worship Sri Radha’s birthplace. With all your heart take shelter of Sri Vrndavana, the best of all holy places. I meditate on Vrndavana , where the cuckoos sing the fifth note, the flute plays splendid melodies, peacocks sing and dance, vines and trees bloom, splendid and charming forests are wonderful with many birds and deer, and there are many splendid lakes, streams and hills. May my eyes become overwhelmed with ecstasy by seeing the nectar waves of Vrindavan’s beauty. May my intelligence drown in the nectar ocean of Vrindavan’s glories. May my body become agitated by the swiftly moving currents of ecstatic bliss and thus roll about on the ground of Vrindavan . Falling down like a stick, may I offer my respectful obeisances to all the residents of Vrindavan . May the land of Srila Vrndavana where Subala and the other wonderful cowherd boys, who are all dear friends of Sri Krsna, play, where Lalita and the other splendidly beautiful young gopis, who are all filled with love for Srimati Radharani, enjoy transcendental bliss, and where Sri Sri Radha-Krsna thirst to enjoy wonderful transcendental amorous pastimes day and night, become manifest in my heart. To drink: the freely flowing streams are filled with clear sweet water as nectar. To eat: the dried leaves from the trees are foods as palatable as one could desire. The warm breezes are just as one would have them. To reside: there are clean mountain caves and other suitable residences. Alas! Alas! How unfortunate I would be if I wished to leave Vrindavan ! May Sri Vrndavana , which grants auspiciousness and bliss to all, and which is deeply loved by two or three great souls, become the mother and protectress of blind me. 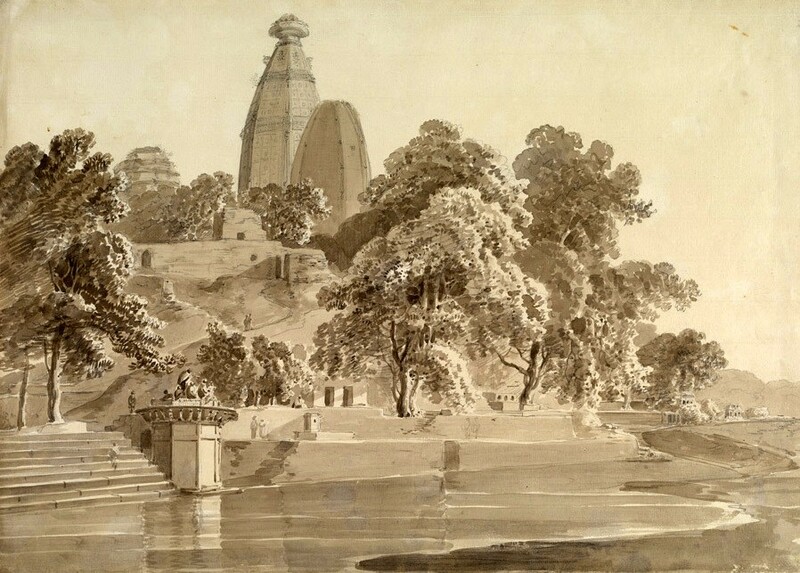 May I love Vrndavana , where at the base of a kadamba tree on the cool shore of the Yamuna a dark complexioned, amorous, divine youth dressed in yellow garments plays a flute as He glances at Radha’s lotus face. He who gives up the company of ordinary people, keeps no servants or followers, agitated with a desire to serve Sri Sri Radha-Krsna, constantly sheds tears, his hands placed on his cheeks and lives in Vrndavana , is the most fortunate of all persons. Where do all people automatically and effortlessly obtain pure ecstatic love for Krsna? Where does the Supreme Personality of Godhead manifest His supremely wonderful pastime form? Where is the empire of the bliss of devotional service to Krsna’s lotus feet manifest? O brother, listen I will tell you a secret. All this is present here in Vrindavan. O brother, please reside under the trees of Vrindavan , and from time to time enter the villages to beg alms. Drink as much Yamuna water as you like. Dress in some rejected pieces of cloth. Consider others’ praise of you the most bitter poison, and their disrespect sweet as nectar. Serve Sri Sri Radha-Muralidhara, and never leave this land of Vrindavan. Vrindavan is wonderful. The two sweet fair and dark splendors named Radha and Krsna are wonderful. Pure love for Their lotus feet is wonderful. He who has faith in Them and rises to the spiritual world is wonderful. The rare soul who understands these truths is wonderful. I worship two splendors who are more handsome than millions of Rati-Kamadevas, who have stolen the glory of millions of Laksmi-Narayanas, whose forms are effulgent as gold and sapphires, and who enjoy pastimes in the forest of Vrindavan. Let us worship the Person more splendid than a blue lotus and sweeter than the nectar handsomeness of all other forms of Godhead, who wanders in a forest filled with nectar from Radha’s feet. Even glorious Laksmi-devi, who rests on Lord Narayana’s chest, cannot taste the supremely sweet nectar Radha’s maidservants always taste in many ways. O dear friend, please worship Radha in Vrindavan forest. In Vrndavana forest the trees are called druma because they melt [dru] with love for Krsna and they are also called taru because they shield [tarana] Krsna from the blazing sunshine [tarana]. The vines are called vratati because they have taken a firm vow [vrata] to serve Krsna. The deer are called krsnasara because Krsna is their life and soul [sara], and they are also called mrga because they always search [mrg] for Krsna’s footprints. Anointing your entire body with the dust from the feet of the residents of Sri Vrndavana , seeing Sri Vrndavana as the supreme effulgent transcendental realm, and meditating on the fact that Sri Sri Radha and Krsna are always charmed by the sweetness of Sri Vrndavana , please reside in this transcendental abode, Sridhama Vrndavana. How can a person who has never seen Vrindavan’s Yamuna river, which is filled with eternally blooming indivara, kamala, kahlara, kumuda, and other lotus flowers, all filled with the sweet humming sounds of bumblebees, and which displays the places where Sri Sri Radha-Muralidhara and Their friends enjoyed transcendental pastimes, remain alive?